We slept well that night and got up early even though we didn't have to be at the train station until 10:30 AM. Will worked on the computer and I read my book, The Abstinence Teacher by Tom Perrotta. While we were ready to head home, we were also a bit sad to leave our fabulous hotel room. After we were packed and ready, Sam took us downtown to the train station. The first leg of our journey was on a regular Amtrak train, a commuter train I guess. The day was quite gray and dreary, actually, so the view from the train wasn't all that exciting between Milwaukee and Chicago. The ride took about an hour and an half. I was totally absorbed in my book so it went by quickly. Oh, one weird thing, there was a fellow who pushed around a little cart filled with snacks for sale. I was hungry so thought I might buy a snack, but when he arrived in our car, he scared us sufficiently enough for me to lose interest in making a purchase. He was really loud and had this pink Spiderman that he sort of flung around in the faces of the passengers and then laughed hilariously and said, "Don't be afraid. It's not *really* Spiderman." It was rather bizarre. I know that Will and I used to live in NYC and I walked through Grand Central Station on my way to work, but we live in small city now and arriving in Chicago's Union Station was somewhat overwhelming. So many people. It was crazy. We were starving (yet again) so we maneuvered our way to the food court which was also packed with people. We finally found a place to sit and Will went off to buy sandwiches for our lunch. I read some more and realized that I was going to end up finishing my book well before our train ride was over so after lunch, I wandered over to the newsstand to try to find a book. I ended up with American Wife by Curtis Sittenfeld. We had about two hours before our next train. Since we were riding in the sleeping car of the next train, we were supposed to go to the Metropolitan Lounge. We walked in circles a number of times before we found it and then I have to say, it was not too exciting. I was thinking maybe there would be something special about it - I don't know why - but no, it was not at all special and hideous fluorescent lighting. But it was a place to sit that wasn't so hectic and that was a nice thing. I went back to my reading and Will took a nap. And then finally it was time to board the Southwest Chief. It's a double decker train that travels daily between Los Angeles and Chicago. I took it from Albuquerque to Chicago way back when in 1993, sleeping in my coach car seat and meeting some interesting folks in the club car. 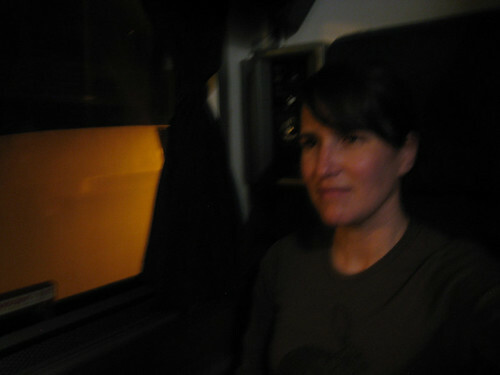 This time around we booked a "roomette" so we could have some privacy and out of sheer curiosity. Never having been a passenger in a sleeping car, I had no idea what to expect. And actually, Will had never been a passenger on a train other than the subway, NJ Transit and Metro North in NY so we were both pretty excited. Not to mention that we both hate flying - he gets sick, I get severe anxiety - so traveling by train was so low stress in comparison. Our roomette was small. Smaller than I envisioned. It's basically two seats facing each other with not very much leg room and an overhead bunk that pulls down for sleeping. The two seats slide down and make a bed as well. There's some storage under the seats but actually luggage does not fit anywhere. That wasn't a big deal. We left our bigger stuff in the rack downstairs and just took the necessities to our roomette. We were located upstairs with about 10 other roomettes and a bathroom. Downstairs there were more bathrooms, a shower/changing room, the luggage rack and two "bedrooms" which I imagine our somewhat more spacious than a roomette. 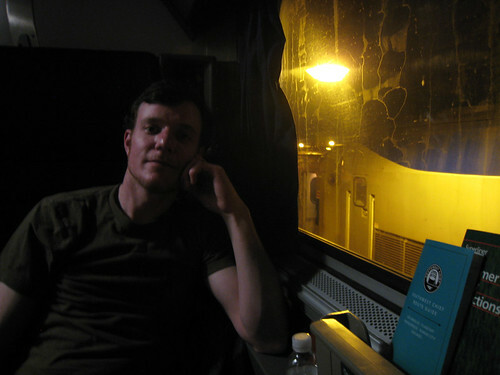 In the other half of our sleeping car were "family bedrooms" or something like that. They were L-shaped and had multiple pull down beds, a sink and a private bathroom. So while the sleeping car is first class, it is by no means luxurious. I was happy though. (Of course I don't have long legs.) Alright, I admit that the roomette is vaguely claustrophobic but not in an anxiety-inducing way and hey, the observation car exists for a reason. A roomette would be perfect for one person. And in fact, across the hall from us was a young man traveling alone. He basically went in the roomette and emerged only for meals. The hallway doors do have curtains, but they don't always close perfectly so we could sometimes see into his space. Yes, I am nosy. He had it going on in there. For the first part of the journey, he had some sort of video game thing set up, Xbox I suppose. The next day, I notice that he had his MacBook open and a small keyboard set up with all sorts of equalizer type looking things on his computer screen. So apparently he was doing some recording while on the train. So yeah, a good space for one person. I seem creepy now, right? Spying on our fellow passenger. I've already rambled on for way too long so I'll continue this in another post.